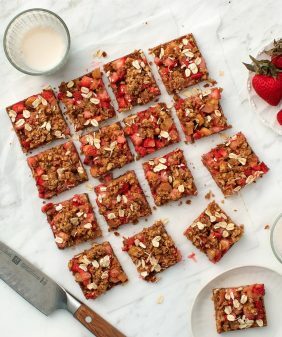 This 10-ingredient strawberry crumble is the easiest summer dessert! It's nutty & delicious, and a splash of balsamic vinegar gives it a little pop. 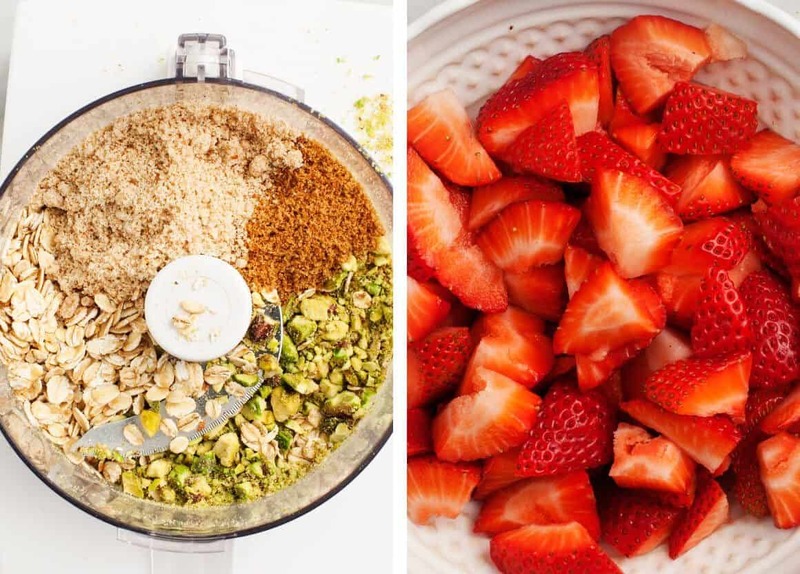 This red and green ingredient pairing of pistachios and strawberries is like Christmas in July, er… June. 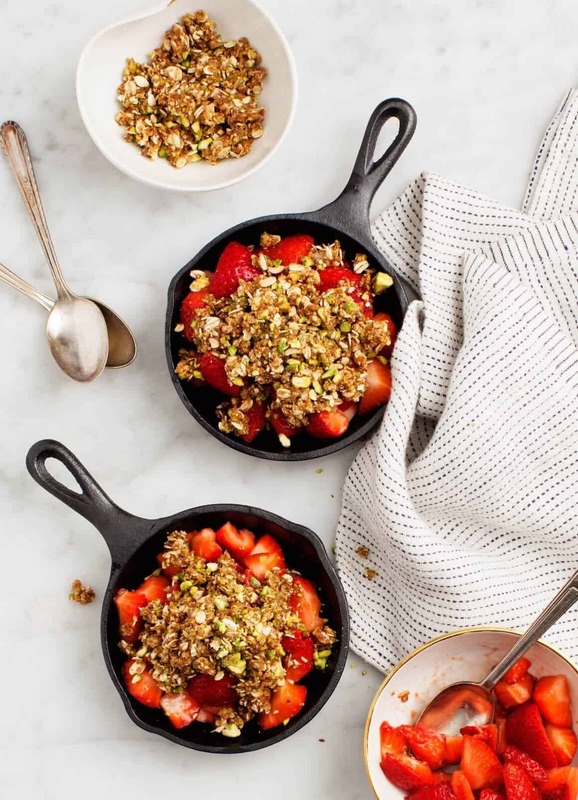 This strawberry crumble recipe works just as well with walnuts or pecans, but it’s just so pretty with pistachios. While I got the ingredient idea from Bon Appetit’s pie recipe, this recipe is actually a version of a peach & plum crumble that I made last summer. It’s not too unhealthy as far as desserts go, and it’s much easier than pie. I use almond flour (that I make myself by blending raw almonds) so that it’s entirely gluten free. It’s also vegan, made with coconut oil instead of butter. The crumble topping is so nutty and delicious, I also just love it raw on top of cold sliced strawberries. 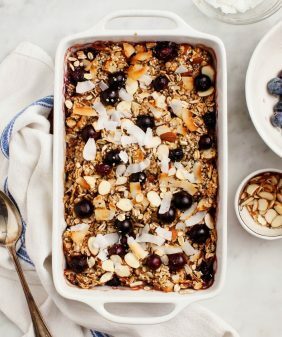 If it’s too hot outside to turn your oven on, make this parfait-style! The crumble will keep in a container stored in the fridge for at least a few days. Make strawberry shortcake, a strawberry tart, or strawberry salad next! This easy strawberry crumble is one of my favorite summer desserts! Blueberries and lemon would be equally delicious in place of the strawberries and balsamic. Preheat the oven to 350°F and grease 4 small ramekins or mini-skillets with coconut oil. 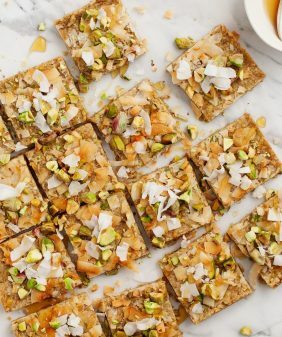 In the bowl of a food processor, pulse the oats, pistachios, flour, coconut sugar, cinnamon and salt until just combined. Add the coconut oil and pulse again. Add the water and pulse again. The mixture should be crumbly. In a medium bowl, combine the strawberries with the balsamic vinegar. Divide the strawberries between the ramekins or mini-skillets. Top with the crumble. Bake 15 minutes or until the fruit is bubbly and the topping is lightly browned. Remove from the oven and let cool for 10 minutes. Serve with scoops of vanilla ice cream. Alternatively, this can be served unbaked. Sprinkle the pistachio crumble over the fresh strawberries and top with a dollop of yogurt, if desired. 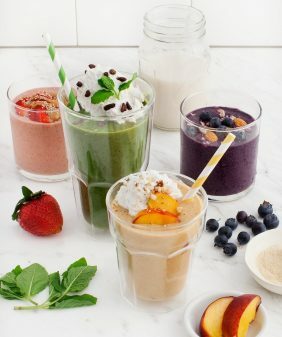 *You can make your own almond flour by blending 1 cup of almonds (enough to cover the blade), in a high speed blender for about 30 seconds, scraping down the sides as needed. Stop when the almonds become flour-like and before they clump together and turn into almond butter. This looks delicious! I have those mini cast iron skillets and absolutely love them for desserts! Yum! I love this combination, and it looks so easy! Wow, the spring-inspired red and green really does make for a beautiful presentation. And I bet the flavor is out of this world, especially with the balsamic. Another recipe I need to put on my list to make! 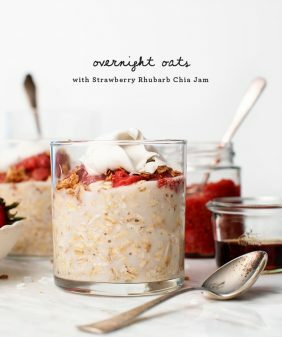 Strawberry and pistachios sounds like an amazing combo! I love crumbles, so much easier to make than pies! This one looks awesome! This was a huge hit at a dinner party we hosted last night! We are short on small baking dishes, so I made the crumble in a baking dish. It tasted like a classic dessert – and will surely become one for us. Thank you! This looks awesome and easy to prepare. Gonna try it out. Thank you for the post. Great recipe, simple but tasy at the same time. love this and also that it isn’t one of those over the top deserts! 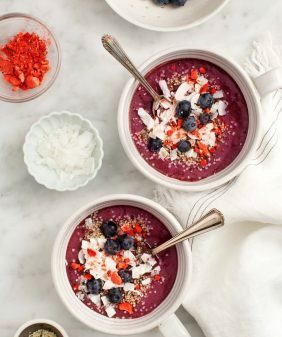 You won’t feel awful after eating it! Thank you for this!